The Autumn of each Olympic Year sees a number of top amateurs taking the big step across to the professional ranks, and 1980 is no exception. The good news is that they seem to be embarking on a pro career at a younger age. Derek Hunt, Tony Doyle and Tony James join the cash ranks full of enthusiasm and ambition for the tough task ahead. But experience holds little respect for youth and Sercu & Co will ensure that our new Pros earn their laurels the hard way. The rewards for a winter's racing on the indoor circuits are great, but such rewards are for the consistent crowd-pleaser. 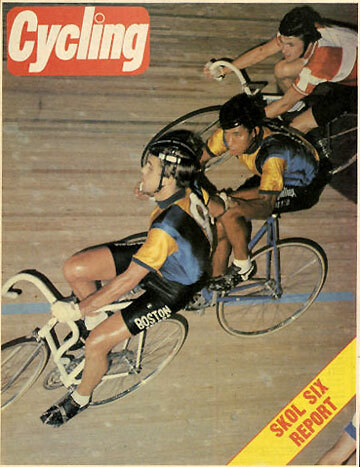 Among the British contingent, we very much hope we have emerging talent to challenge the Continentals at their own game and take the place of Tony Gowland, who we all remember for his splendid riding during the 1970's. 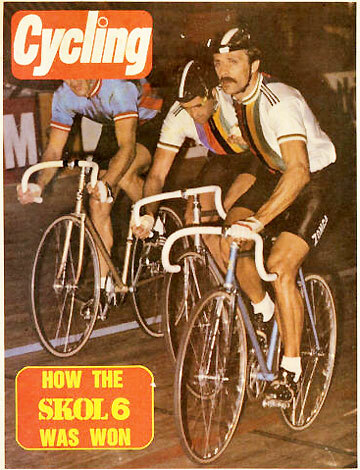 Last year, when Patrick Sercu won the SKOL 6, he equaled Peter Post's all time record of 65 wins. Now, he has already pushed the total to 72. One wonders what his eventual total will be and whether any rider in the future will ever equal the track cycling talents of Patrick Sercu. 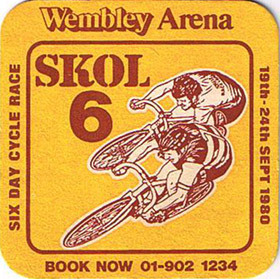 Danny Clark and Don Allan have been adopted by the Wembley crowds and it is most pleasing to welcome them to the 1980 SKOL 6, wearing the well deserved jerseys of European Teams Race Champions. As well as all the World stars contracted here, we welcome three other British riders who have all ridden in this event before, Ian Hallam, Nigel Dean and Maurice Burton. All have acquitted themselves well in past SKOL 6 events and earned their return appearance. Tony Doyle's splendid pro pursuit title win in the recent world championships in Besancon will be a great boost for British cycling. His controversial defeat of title holder Bert Oosterbosch in the quarter finals makes a revenge match a very exciting prospect. This takes place on Tuesday 23rd September, sponsored by KP Crisps. The teams we have competing, and the programme of racing events, will ensure a high level of sport and entertainment, it only remains for me to hope that you thoroughly enjoy the promotion. 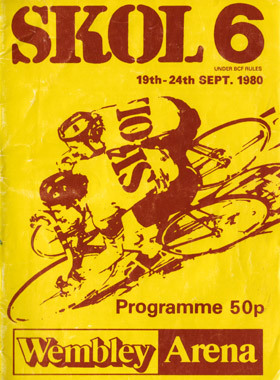 A copy of the 1980 Skol programme has become available and used to expand the info online. Any copies or scans of any related material would be very helpful.